God help Dan Gilbert if the recent rumors are true. 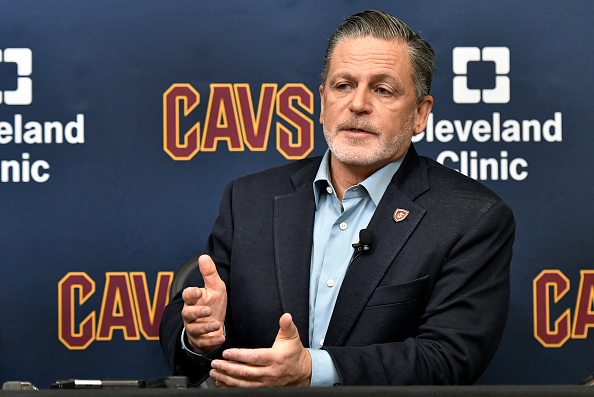 If what everyone has been saying about the Cleveland Cavaliers owner lately – including his reported standoff with LeBron James – is accurate, this team is royally screwed. To sum it up, we’ve spent the past week hearing about Gilbert trying to oversee basketball operations. He’s apparently a huge fan of Isaiah Thomas, the Cavs’ new point guard/worst player. Gilbert is trying to hold on to the Brooklyn Nets first-round pick during tomorrow’s trade deadline, which sounds smart on the surface. However, that he’s apparently doing so because he foolishly thinks he doesn’t need James to succeed is equal parts concerning and stupid. Again, these are all rumors. With the trade deadline now hours away, it’s only natural for stories like these to come flying out of the woodwork. However, if there’s even the slightest bit of truth to any of this, the Cavs are on the verge of being absolutely ruined by their owner. To be fair, nothing is going right for Cleveland right now. I’d dig into recent results, but I can only get as far as the team’s nine-point, fourth quarter effort in last night’s blowout loss to the miserable Orlando Magic before my eye starts twitching. The players apparently hate each other, and tomorrow stands as a potential breaking point for the season. However, the red thread through all this mess is Gilbert. Based on what we’ve heard, not only is he accepting the possibility of James leaving in free agency this summer, he’s actually embracing it. Again, if this is really true, if Gilbert is no longer afraid of losing James because of some sort of “we’ll be just fine without you” mentality, it would be a disaster. It’s one thing to be nervous about the best player in the league leaving. It’s another to be the driving force in his departure. Sure, James fleeing this summer was always on the radar. Cleveland fans are reminded by national media on a daily basis any time the smallest rumor comes out about his potential relocation. However, there’s a difference between James leaving on his own terms and departing because his owner is acting like an entitled brat. If Gilbert is, per the reports, scoffing at the idea of James heading elsewhere since one championship was enough. If, instead of trying to keep the best player on the planet, he’s hitching his wagon to Thomas, who’s been miserable both on the court and off it in his short time with the team. If Gilbert really is dumb enough to draw a line in the sand with James, then it wouldn’t be impossible to believe he not only thinks he’s right, but he also assumes the fans would once again take his side. Knowing the moves he’s made over the past year, this doesn’t seem out of the realm of possibility. I imagine Gilbert thinks the reaction to another free agency debacle with James would be like 2010 all over again, when a scorned city rallied around a ludicrous letter he published. Cavs fans were happy to turn James into the bad guy back then, happy to side with Gilbert in his ill-fated quest to win a title without the best player in the NBA. The reasons why this wouldn’t be the case this time around are obvious. Gilbert did nothing without James. He was only able to win a championship because he flew down to Miami four years later and successfully groveled enough to convince him to come home. The years minus James? Those featured a Cavs team losing 26-straight games. Drafting Anthony Bennett first overall and saying “we’re done coming to the lottery.” No playoff games. A guarantee Cleveland would win a championship before the Miami Heat falling laughably short. In a word, the Cavs were irrelevant. And now it appears Gilbert is willingly pushing the team back to those dark days, thanks in part to an ego trip he’s having against a player who turned the Cavs into a contender overnight. What Gilbert has done over the past year has been disastrous. Letting GM David Griffin walk, pushing for the Thomas trade, trying to run the show on his own. These have all back-fired in tremendous fashion. Fans are not blind to this. Nor are they willing to accept this team getting worse by design. However, unless Gilbert somehow learns to check his ego at the door, it sure sounds like we’re heading down a path where a team owner actually believes he’ll be better off without the best player in the league. He’ll find out almost immediately this won’t be the case.